But it has been argued that Amazon is over-valued in terms of market-cap (which is the price of a share of its stock x the number of outstanding shares). The current share-price/profits-per-share ratio (P/E) for Amazon is over 200, compared to a P/E ratio of 20 or less for most U.S. companies, including Apple. Not taking anything anyway from Amazon’s business model, but is Amazon REALLY worth 10x Walmart? 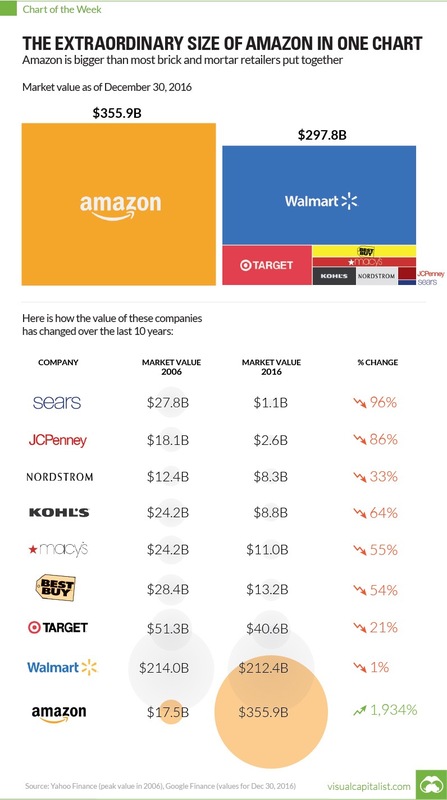 One could make a great argument for 2x or 3x but unlike Sears and Penneys, I don’t think Walmart is going under anytime soon. Thanks for your various comments. I just saw them. I will “digest” them, compare notes (so to speak), and write back soon. The point I meant to make is that Walmart’s P/E is about 18-19. So for every dollar of profits, Amazon shareholders (at 200 P/E) are paying more than 10x what Walmart sharefholders pay. To me this seems like tulip mania. Perhaps owning Amazon stock is more like buying an expensive article of fashion (e.g. an Hermes scarf), while Walmart stock is more like a cheapo brand. The cheapo brand is the better value, but the fancy brand signals taste and exclusivity.